When I serve baked potato at home it always reminds me of the Wendy’s fast food in Philippines as they offer it in their standard menu (that was before not really sure now), I love the newly baked and tasty spud topped with delicious toppings such as sour cream and chives, cheese and cheese, cheese and bacon and cheese and broccoli. Just by writing those flavours alone make me drool. 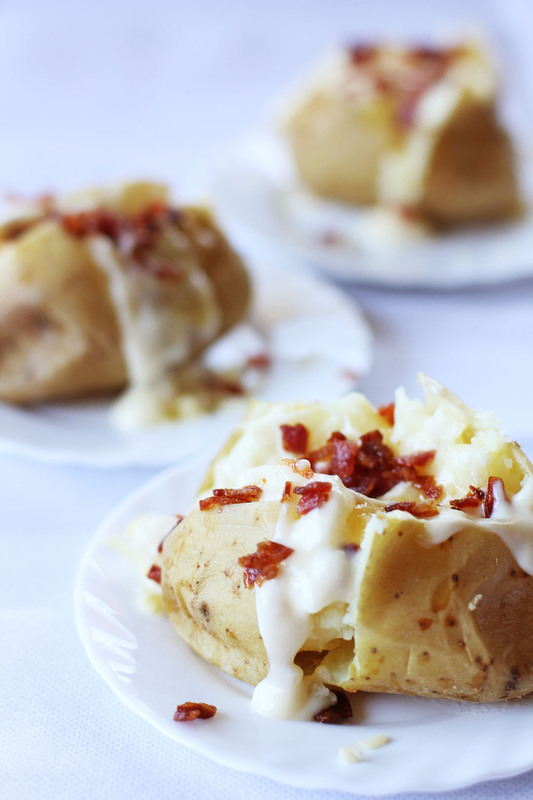 Baked potato or Jacket potato is popular dish in North America, UK, Russia and Turkey. There are different ways of cooking and different array toppings but nearly all variation yields the similar result where the potato should have a fluffy soft texture inside and a crispy skin outside. To achieve that different methods are used for cooking this spud and the popular way is by baking them but if you are in a hurry then microwave is faster option (usually 15 minutes per spud). If you don’t have an oven then convection oven or even barbecuing is an option but trust me nothing beats baking this in an oven as it gives a crispy skin and mashed potato texture result. To bake the perfect potato, prior to cooking, the potato needs to be scrubbed clean, pricked with fork multiple times, pat dry with paper towel. Keep in mind that you also need to use floury potatoes and not the waxy variant. Scrub clean the potatoes over a cold running water, prick multiple times with a fork around 1 inch deep then pat them dry with paper towel. Place in a baking pan and bake for 15 mins at 220C then lower the temperature for to 180C and bake for 1 more hour. In a non-stick pan, add a small amount of oil and fry the bacon until crispy, drain then set aside. You can also place the bacon inside the oven over an ovenproof plate then crisp it together with your potatoes, just check once in a while to see if it’s crispy already then remove it to cool down. I've done this but did not measured the time, I just kept on looking inside. Chop bacon to small pieces. On a sauce pan melt the butter then add the flour, cook until it forms a roux. Lower down the heat then slowly add the milk, mix well and stir until it starts to thicken. Season with salt and freshly ground black pepper then add the grated cheese, stirring again until the cheese melts. Once potatoes are cooked, cut the top with an "X" mark then using a pot holder gently push the two sides inwards to mash the inside and pop out the spud on the "X" mark. Now top it with the cheese sauce, sprinkle with more grated cheese and bacon pieces. 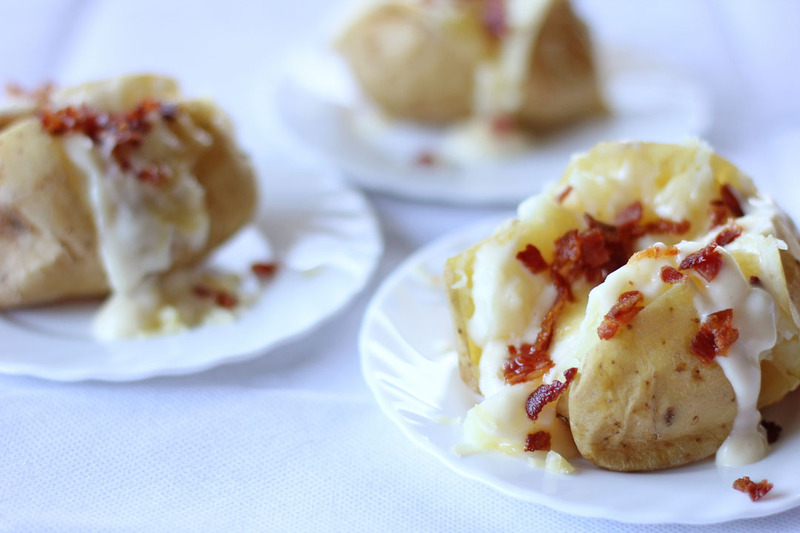 simple and delicious.. i love baked potatoes. Memories of Filipino fast food…I’m still looking for a JollieBee replica in the States! Other than in Hawaii of course. Wow this recipe I’m looking for, I immediately tried I love it, thank you so much. Classic comfort food item! Never fails! Baked potatoes! I’m a huge potato fan. I can honestly eat this everyday!